It's become tradition that, by the end of the year, the United States of Pop compilation surfaces whether we ask for it or not. Tracks from all the big hitters that've dominated radio waves and top charts make the cut. We scream and marvel at how easily all these tracks blend together. It paints a picture that we, the people, have pop hearts beating to the sound of an 808. This picture, however, isn't even close to the real statistics. Paul Lamere, The Echo Nest's Director of Developer Platforms, sourced Spotify and a "range of data services" to figure out what the nation is really listening to. Turns out pop is merely icing on an overall alt/indie-rock cake. 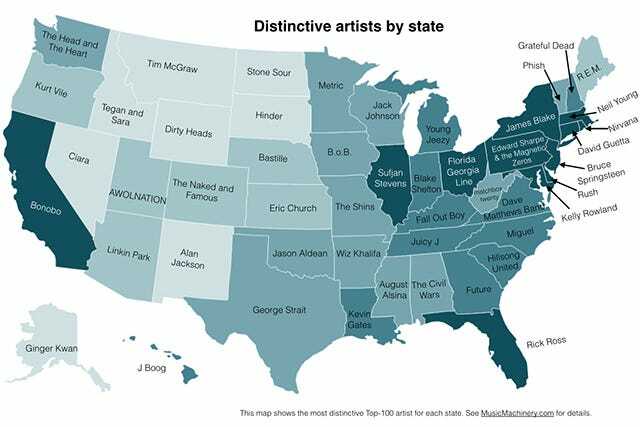 Lamere's map shows what music artist gets the most playtime by state. New York, for example, mellows out to James Blake whereas the Midwest feels the Illinoise with Sufjan Stevens. The South predictably jives to country and the North, Northeast is still chock-full of Deadheads.